Bing Ads Editor has improved the way Google Ads import within the interface. The updates focus on improving the reliability and speed of the process, ultimately easing the process for advertisers using both platforms. The first update gives advertisers the opportunity to skip local uploads. You are now able to import Google ads campaigns directly to the Bing Ads interface. Before this update, advertisers first had to upload campaigns to the local machine, then post them to the online server. 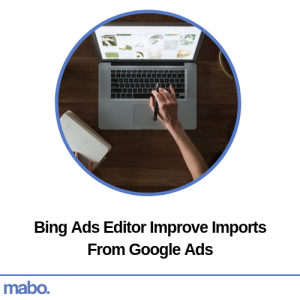 Bing have also improved parity with web imports, meaning the import and scheduling options within Bing Ads Editor now match those within the Google Ads user interface. During the import process, advertisers are now able to determine bids, budgets and landing page URLS specifically for Bing Ads. In addition to this, within the “advanced options” dropdown menu, you are now able to select the campaign aspects you want to import. As you can see, these new updates and features not only make the process easier, but will save advertisers a great amount of time when sorting campaigns within Bing Ads.